This is hole in the wall between the lower heart chambers that causes oxygen-poor blood to mix with oxygen-rich blood. Narrowing of the pulmonary artery outlet. This is mostly in combination with an abnormal pulmonary valve. It causes a bottleneck for blood flowing from the right lower heart chamber to the lungs. The right ventricle (right lower heart chamber) muscle wall becomes thickened and enlarged. This happens because it has to work harder in order to try and keep up with pumping blood through the narrowed pulmonary artery. The aorta straddles the septum (wall) between the ventricles (lower heart chambers). 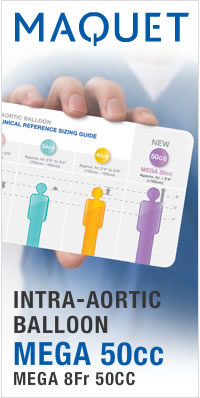 This causes oxygen-poor blood from the right side of the heart to enter the aorta. It then mixes with oxygen-rich blood on the left side of the heart and the mixed blood is pumped to the rest of the body. 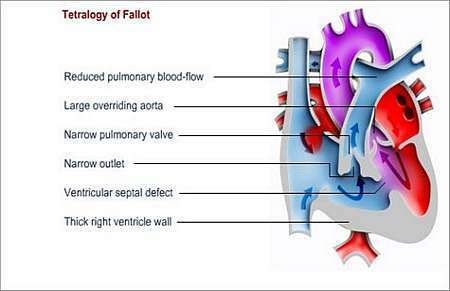 The ventricular septal defect and the narrowed pulmonary artery diminish blood-flow to the lungs. Furthermore, oxygen poor blood gets into the systemic circulation because of the septal defect and the straddling aorta. The combined effect is that the oxygen level in the blood that gets transported to the largest part of the body may appear blue on examination. 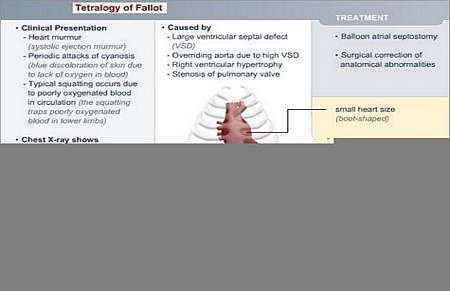 Surgical correction is required for small infants with tetralogy of Fallot. Heart surgeons use the shunt procedure in order to temporarily fix the condition. This is an interim measure to allow more blood to reach the lungs until the right time when the defects can be corrected. The shunt procedure allows for more oxygenated blood to enter the systemic circulation (the rest of the body) and it reduces the cyanosis. When the child is a bit older, the other heart lesions can be treated more effectively. Open-heart surgery to correct the defects is usually performed between the ages of 8 months and 5 years. The ventricular septal defect is usually covered with a patch and the pulmonary valve is widened.